As I mentioned in my last post I knew I wouldn't be able to upload anything until today. Yesterday was spent in Board meetings for the Art League of Alexandria and it was a really productive day. This is an exciting time at the Art League and we have some special events scheduled for this summer that are going to be a lot of fun. More about that shortly. 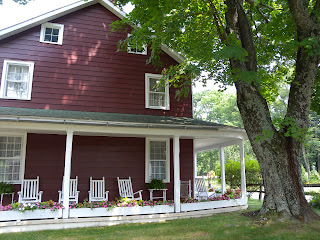 To the left is the painting you can see on the easel in my post from June 25th. I also give you a good view of the scene from my vantage point behind the easel on that same post. The light was amazing! It was still early enough to see all the jewel colors with vivid blues, yellows and greens predominating. When you see the painting on my easel two posts back it was getting close to quitting time on this piece. The light as we approached noon really started bleaching out the colors and I decided to leave the tweaking for the studio. As you have already read, we then broke for the extraordinary lavender infused lunch. All I did at home was adjust the sky holes in the tree a little, put in a few more streaks of brilliant yellow and slightly brighten the blue in the sky. It is finished. Unfortunately I am out of 11x14 frames or I would enter this in the Art League show on Monday. Hmmm, maybe I can take a frame off another painting. I hate doing that when the backs are already papered so I'll see. These brilliant colors and light surrounded me in every direction. There were lots of artists painting so I would be able to include them in whatever scene I was looking at. What drew me to this site was that tree. 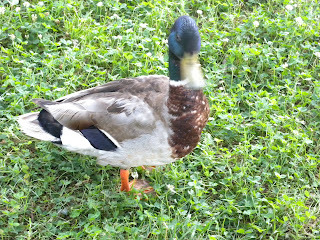 There were willows all around the pond but this was something different. Maybe it is some sort of willow I haven't seen before. I wish I had asked. What I loved was its form. It looks like it is perpetually in motion and bending from the wind. The day had a comfortable breeze but nothing to create that movement you see in the tree. 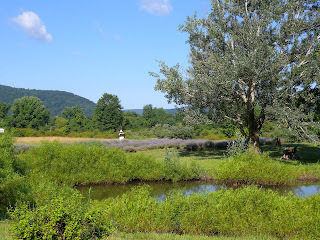 I also loved the silvery color especially combined with the lavender behind it. There is just so much there to paint! I have been bad about updating my website again but go and visit anyway:) http://www.jeanschwartzpaintings.com/ As soon as I get my act together I will upload 7 new plein air paintings. My next post will be about painting #3 from the workshop weekend. 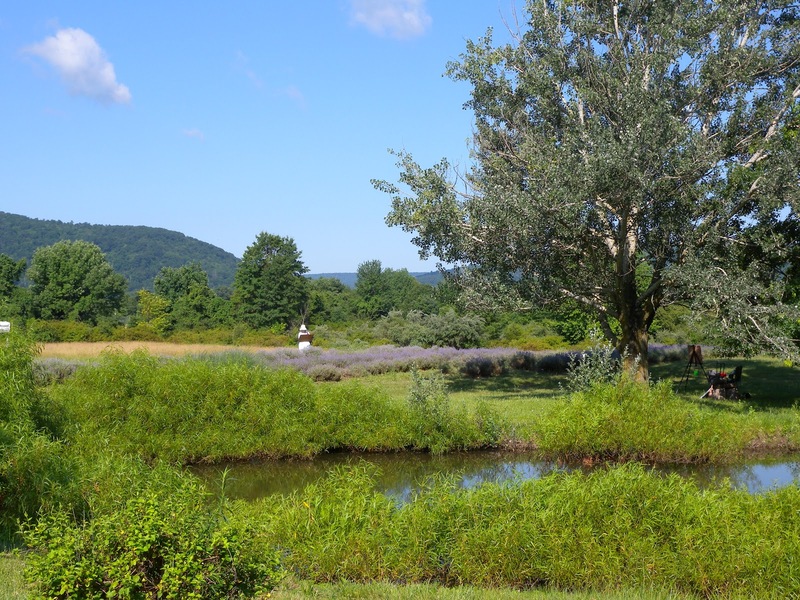 On Monday I talked about the weekend I spent painting in Fairfield PA at both Willow Pond Lavender Farm and Hickory Bridge Farm. The latter was where some of us stayed but the workshop was at Willow Pond. I was the first to arrive on Friday and deliberately drove up early because I was hoping there would be a painting opportunity at the farm. After I checked in I went out walking and decided on this view down from the B&B. 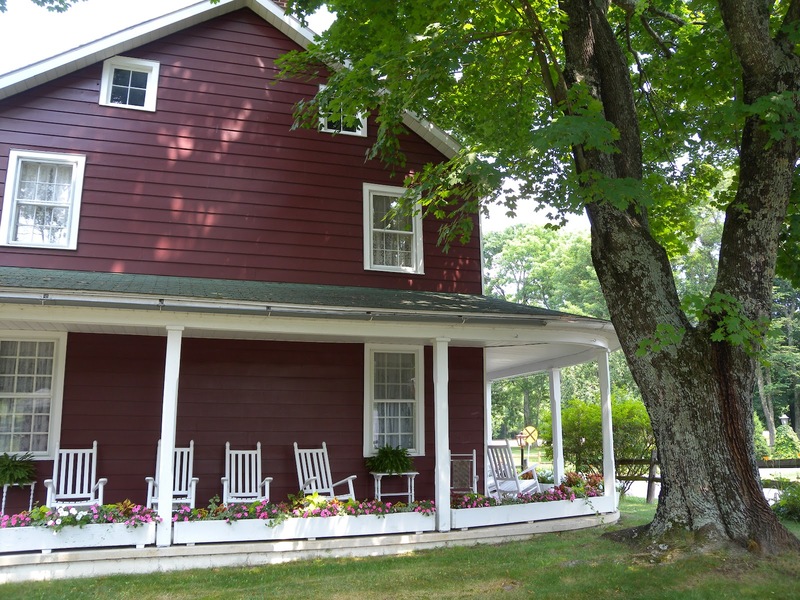 The side entrance to the B&B is up those steps and onto the porch. The larger building is where we had our welcome dinner and it is a converted barn. 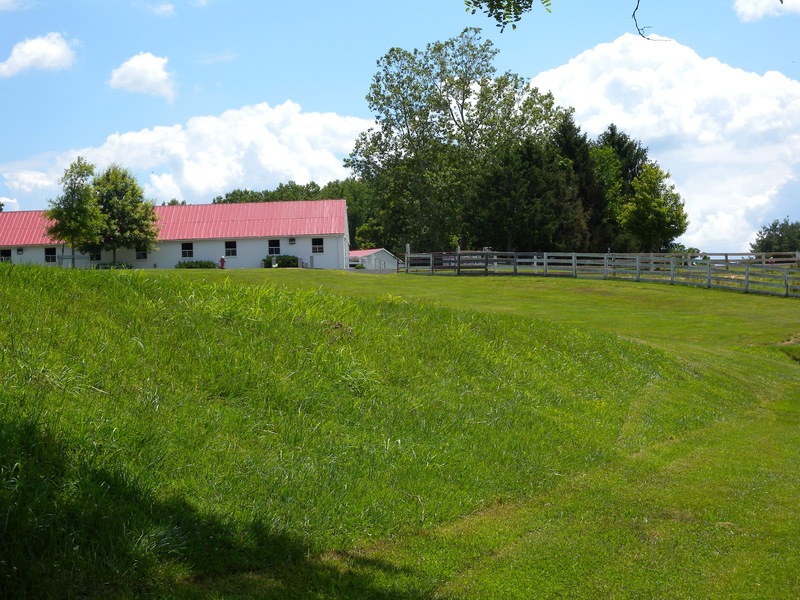 The farm is a working farm that has been in the same family for 180 years. The five children of a country doctor run the operation now. 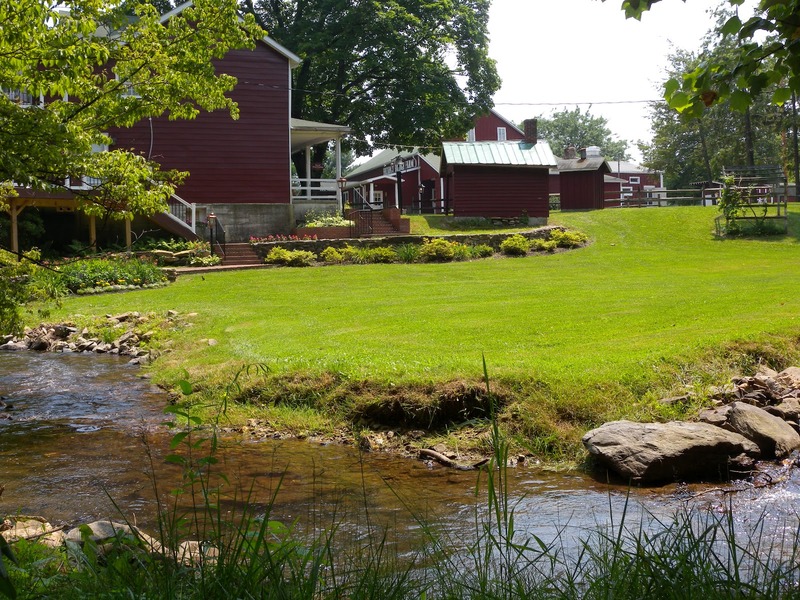 It is a wonderful place to unwind. Bobbi is thinking of holding another workshop here in the fall. If she does I am in! The sun was brilliant one minute and hidden behind clouds the next. There was a brief shower but not enough to budge me from my comfortable spot especially since the painting was well underway. That situation changed as I was close to completing the painting. Suddenly the skies darkened, the thunder rolled and I knew I had a very brief time to gather my gear. Standing under that large tree was not the best place to be under the circumstances so I really got moving. I made it through the door just as the skies opened up and gave us a good downpour. 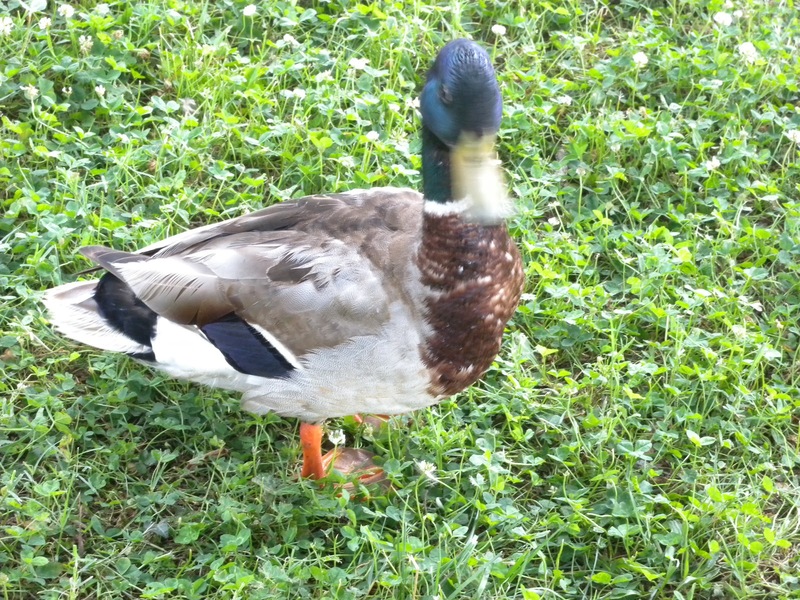 I took this shot just before I had to run for it. It was just short of finished. As I mentioned in the Monday post the workshop is worth a several blog posts. 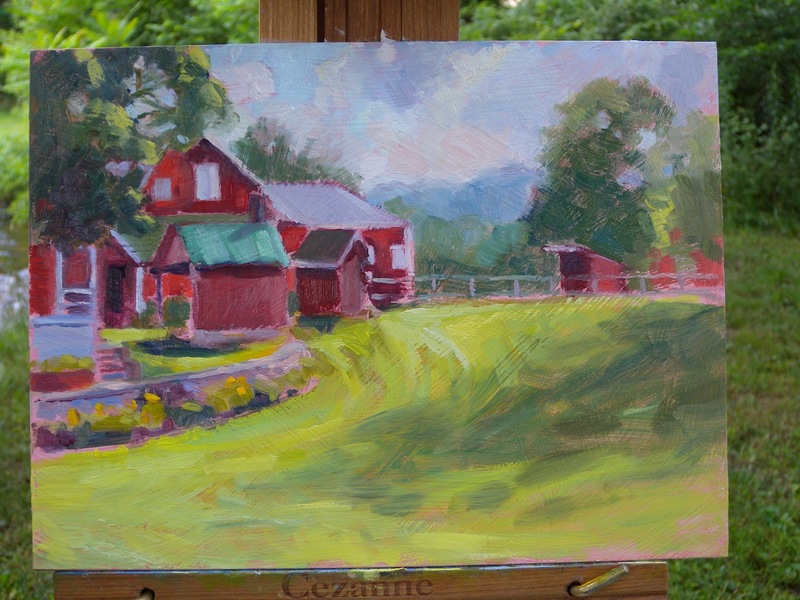 My next post (which probably won't be until Friday) will start off with the morning painting at Willow Pond Farm. I am pleased with all four of the paintings I did last weekend and just wish I hadn't run out of frames. Honestly, I order a bunch at a time but this time I didn't order enough of the larger ones. I have a good number of 8x10 frames but lately I am preferring 11x14. 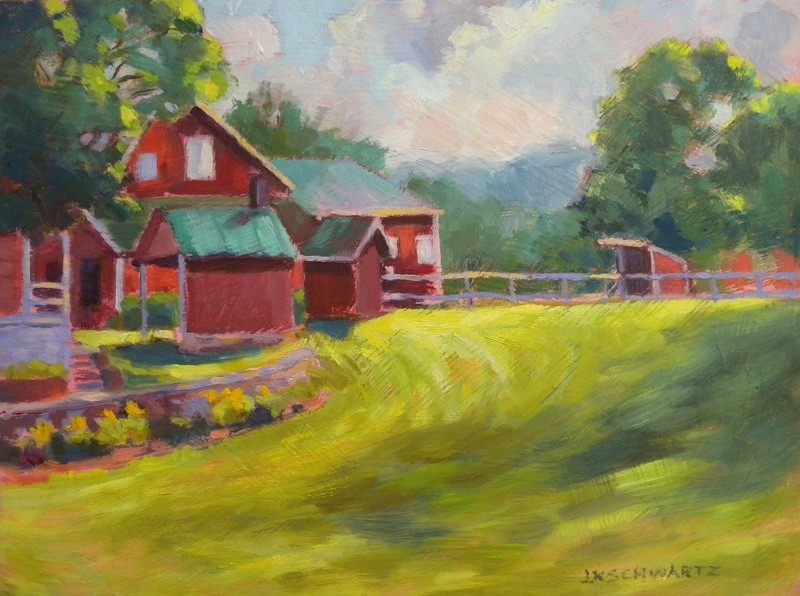 Fortunately I have a 9x12 left for this painting of Hickory Bridge Farm and I think it will end up on the wall of the Bin Gallery at the Art League next week. There were 20 of us for dinner in the converted barn. What a meal! 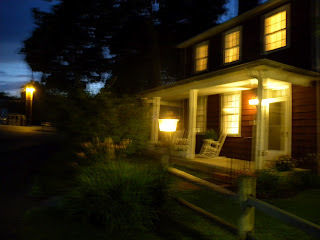 A short walk back to the Inn and a good nights sleep! This weekend I attended Bobbi Pratte's plein air workshop in Fairfield PA. It was spectacular! Great weather, great comraderie and great food! All I had to do for two days was paint, eat and enjoy the company of friends. If that isn't a vacation I don't know what is. Add in all that lavender and stress just fell away. I think I ate more this weekend than I eat in a week at home. 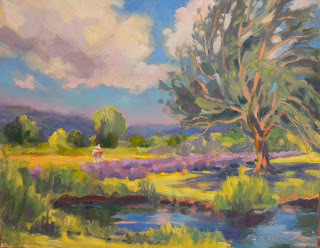 How nice to spend the morning painting and then break for a five course, lavender infused lunch. It was quite a change from my usual bottle of water and granola bar. Who knew you could do so much with lavender. The food was beautiful to look at and even better to consume. The next photo is what I spent two hours doing after that gastronomic treat:) We started painting again at 3:30 and worked until after 7:00. I like the start I got on that painting and it will be easy to finish in the studio. The skies were beautiful all day but particularly then. Everyone arrived by Friday evening and we kicked the weekend off with a welcome dinner at Hickory Bridge Farm where a number of us were staying. 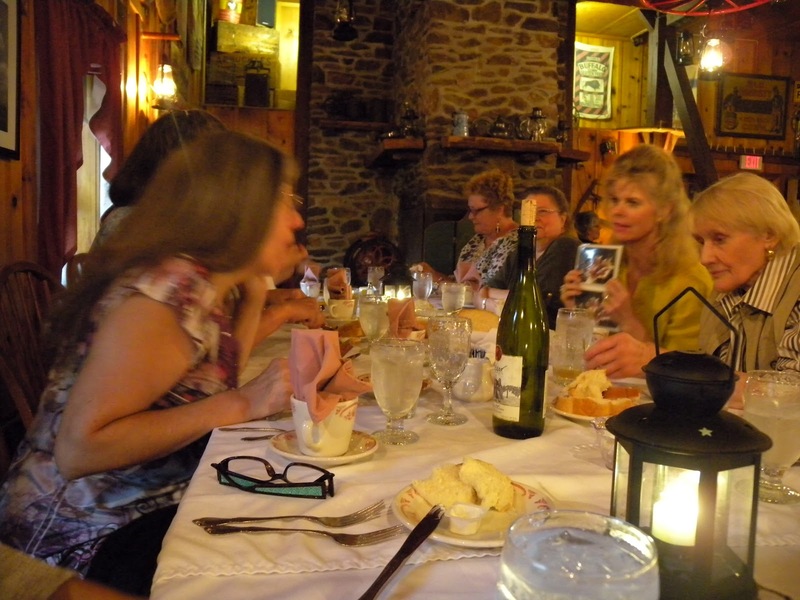 There were 20 of us at an enormous table and dinner was served family style. Five vegetables, three meats and six delicious desserts to choose from. It was a great start to the weekend. I think I sampled everything! We met the following morning at 7:00 for breakfast and were at Willow Farm by 8:00 to start painting. 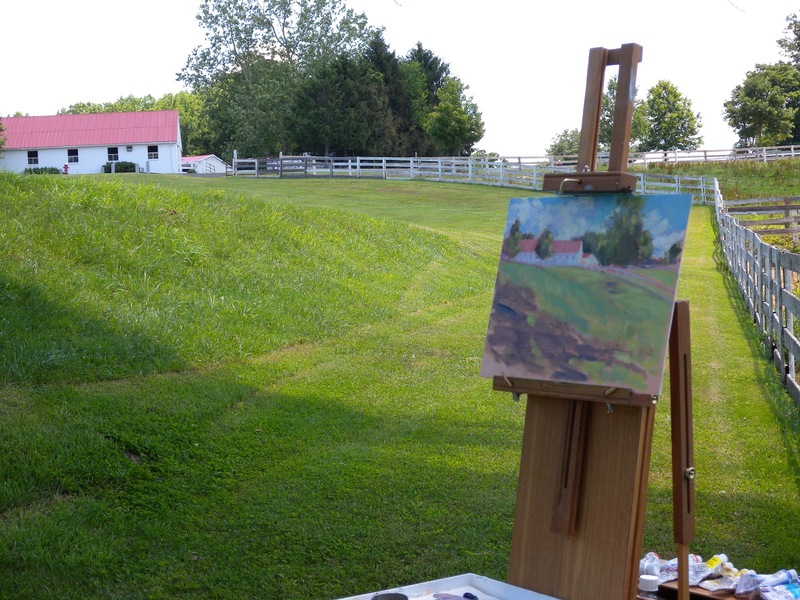 Since I arrived early on Friday I was able to squeeze in a painting at Hickory Bridge so the painting you see on the easel above was my second painting. Of the four I did this one is the only one that is complete. My Friday evening painting had to stop near completion because of a sudden thunderstorm. I will be doing several posts about this weekend and show each painting in progress and then the four of them finished. I think all of these are keepers and will escape "the pile". This is the finished painting that I posted earlier when it was just in progress. 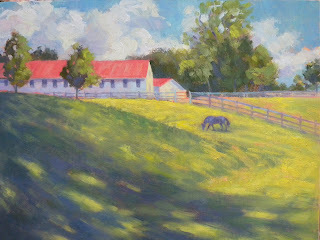 I showed it on my plein air easel out in that field with my mare Gypsy for company. Sadly this morning brought an end to those clear, crisp days and now our usual extreme summer heat and humidity has reared its head. Ugh! I love having all the windows open in the house but it is too warm and so it's back to living in air conditioning. I should be happy we have it. I am also happy I have a studio because I will be spending time in it developing all the new material I have for larger paintings. Being outdoors painting white skies does not enthrall me. 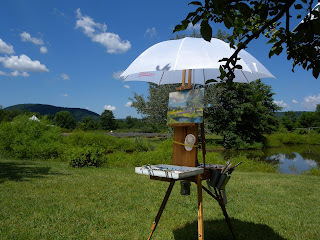 This weekend I am going to be attending Bobbi Pratte's plein air workshop in Pennsylvania. 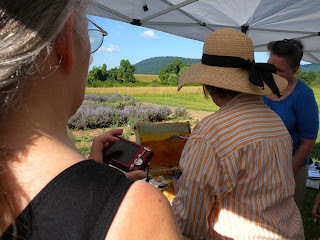 The Pennsylvania Lavender Festival is on and we will be painting on a lavender farm near Gettysburg. I am praying for cooler, dryer air and I know everyone else was hoping the cool weather would hold on for just one more week. Still, I am sure the beauty of the place will overcome any discomfort. 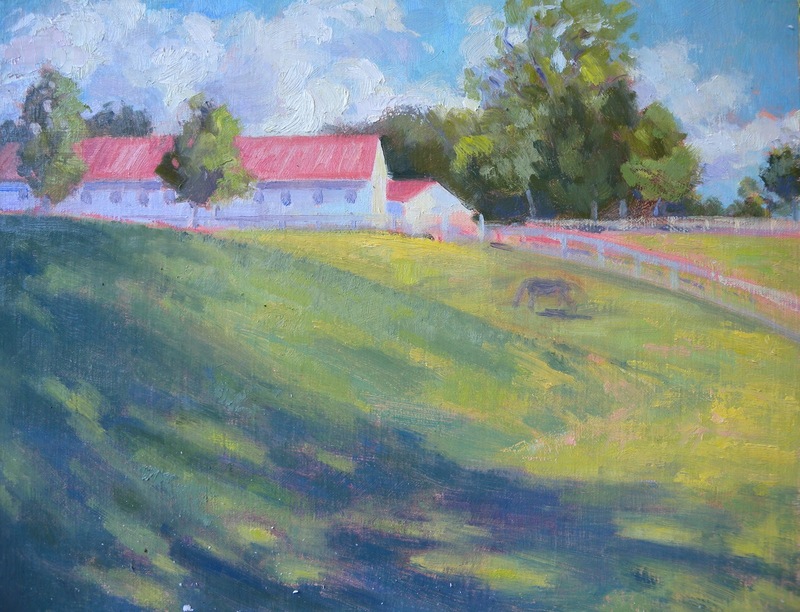 Bobbi Pratte is on the faculty of the Art League School and is both a fellow ALPAP and fellow candidate for the Washington Society of Landscape Painters. She is also exhibiting her paintings along with me and 7 other artists at the Ratner Museum this month. I love her paintings and look forward to what she has in store. I know I will have lots of images to upload when I get home. We will be there Friday through Sunday. "Everyone Talks About the Weather, Artists Do Something About It"
Here is the finished painting that you can see me creating in the last post. I was at the Washington Sailing Marina on Daingerfield Island and I think this gives you a pretty good idea of how perfect the day was. 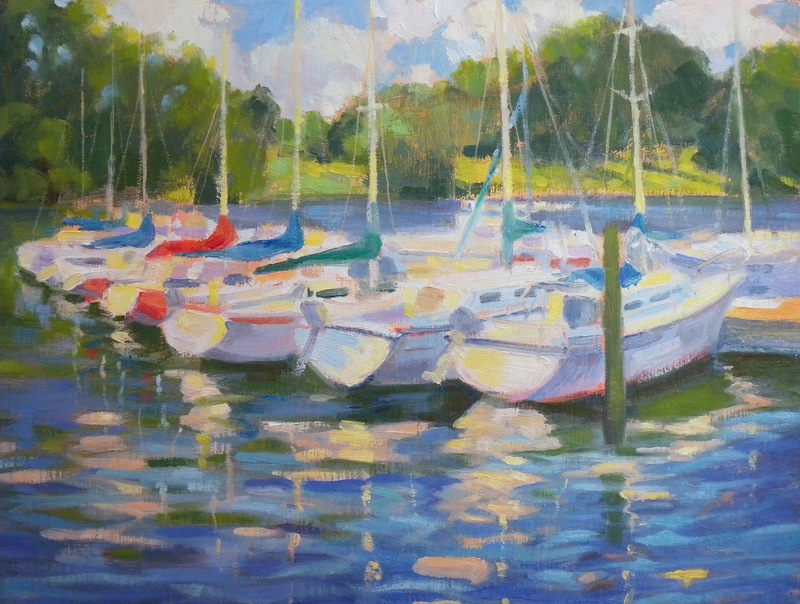 I usually prefer the light of early morning and evening but this kind of brilliant sunlight and bright blue and white skies reflecting on water is a thrill to paint as well! We are entering that time of year when most of our daytime skies are "vanilla skies" due to the heat and humidity common to this area. 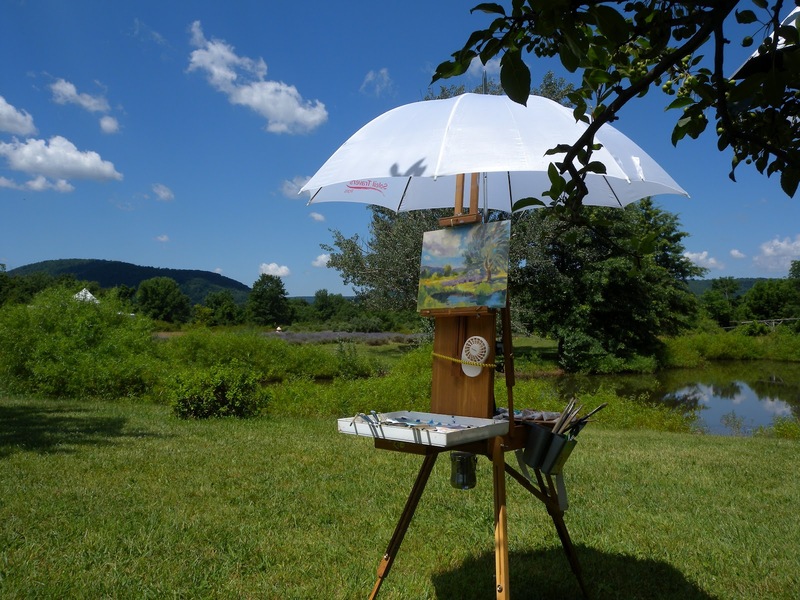 Days like this are a joy for those of us who like to paint outdoors. I also intended to upload the finished painting I did with my mare Gypsy in the field but apparently I never photographed it. It is too dark to do it well now so I will shoot it tomorrow and upload it then. The day was much like this one and the light that day was spectacular as well. 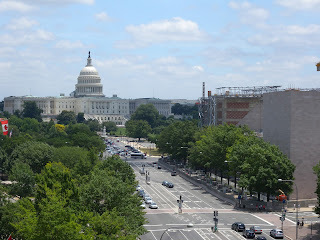 Today for Father's Day our son Chris arranged a special tour for us at the Newseum where he is a Broadcast Tech. 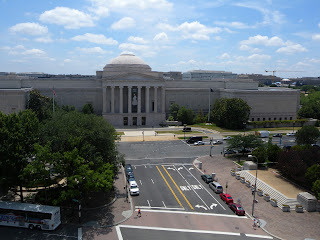 If you live in the DC area and haven't been there yet put it on your list! The building itself is spectacular and to see everything there would take more than one visit. Chris gave us an overview and behind the scenes tour. The real, behind the scenes control center is mind boggling and if you have been there and know how much of this is interactive and computer generated then you might have an inkling of what you might expect in the control room. I am really impressed that my son understands all that and can trouble shoot and repair the exhibits. Yes, I am bragging, it makes me proud and happy that he has a career that he enjoys so much and I am glad that he spends his days in an environment like this. Below are some photos I took from the 6th floor terrace. 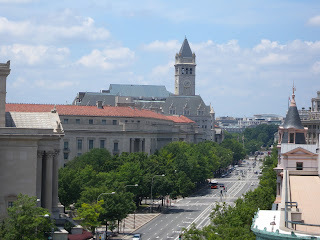 The views of Washington are wonderful! ﻿In the photo of the Capitol you can see the work that is being done on the I.M Pei East Building of the National Gallery. 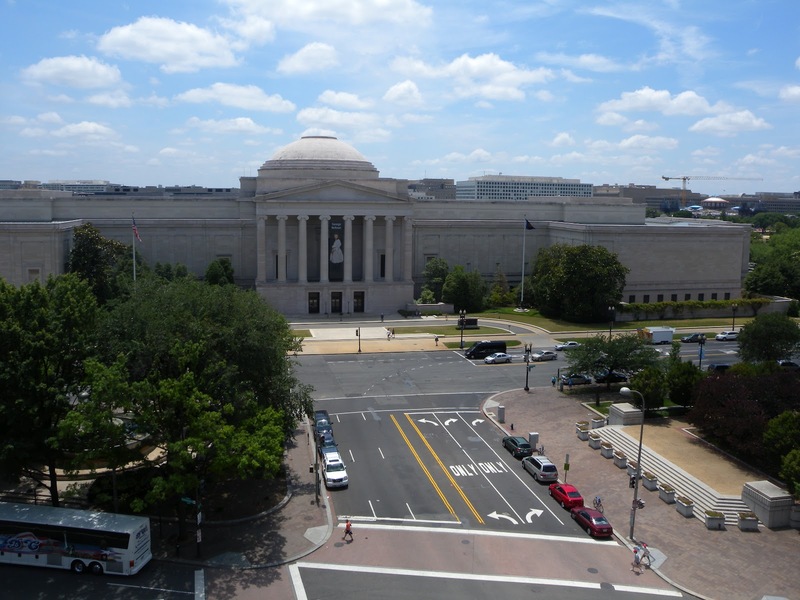 The marble facade is being replaced due to problems with the original bonding material. Marble panels were falling off! Today was one of those perfect, warm, dry and breezy June days. There was a brilliant blue sky full of Mother Nature's whipped cream clouds. 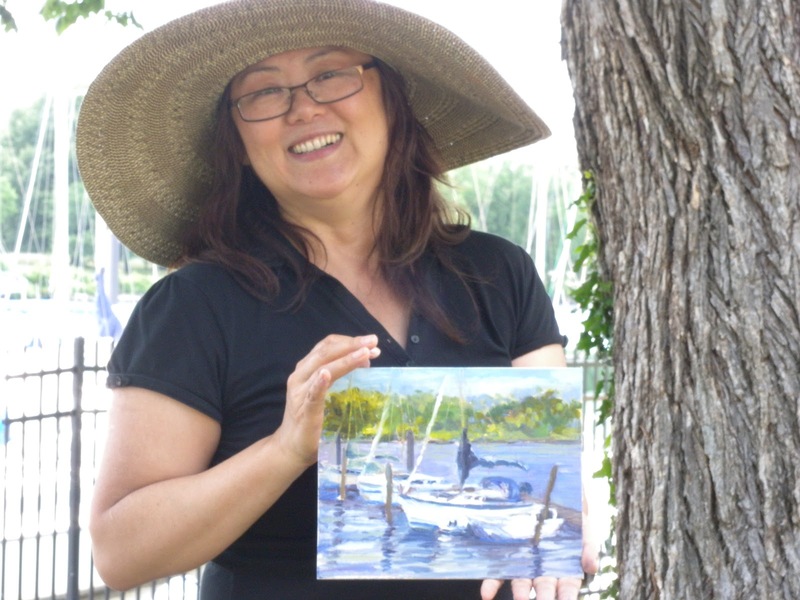 I had the good fortune to spend it at Daingerfield Island (not really an island) on the Potomac where the Washington Sailing Marina is located. This is an incredible location with so much to paint that I have decided to make it a summer project. 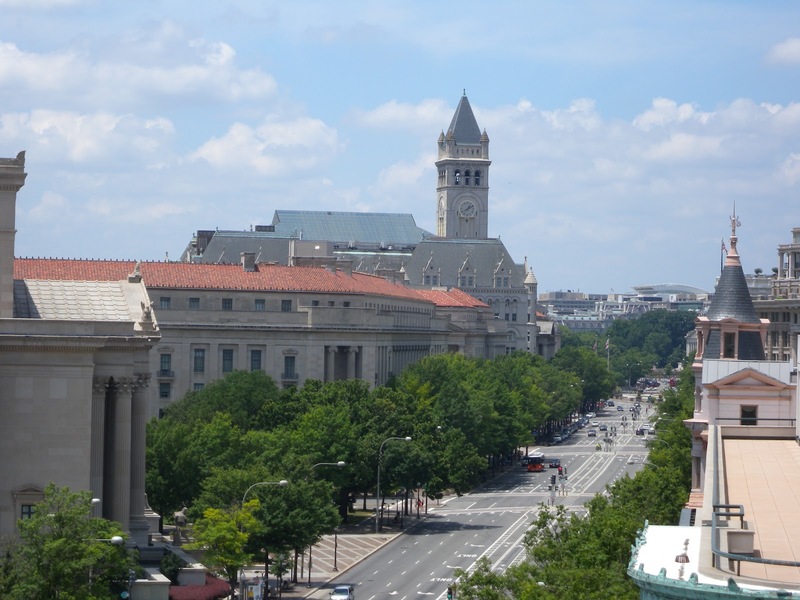 There are great Potomac vistas with views of Washington in the distance or of Reagan National Airport which is the next stop up the George Washington Memorial Parkway. There is no shortage of boats to paint. Even the dry dock area has lots of interest. There are colorful Sunfish sails as well as the brilliant white sails of the larger vessels. 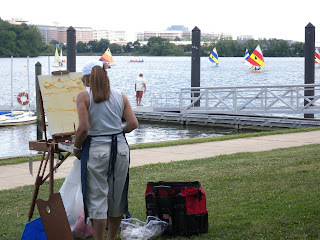 If I get tired painting boats I can always paint the jetliners coming in for a landing at Reagan. They are right over head! Today I was joined by three of my fellow ALPAPs ( Art League Plein Air Painters) Gail Pean, Theresa Miller, and Jack Dyer. Everyone had a successful and pleasant day. Gail Pean at work on a great vista! Proving that the early bird does not always get the worm, Gail, who arrived last set up in front of the Sunfish sailing class on the river just off the point. The colorful sails and spectators created more interest in this view than the rest of us anticipated earlier. Her painting is off to a great start and I look forward to seeing the finished piece. 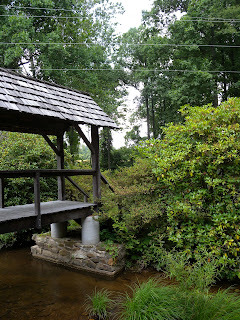 Besides great views there is a restaurant here and a snack bar with a deck overlooking the Potomac. Free parking and a ten minute trip. What more can you ask for! Theresa, like Jack and me, chose to paint the boats moored in the marina. Both Theresa and I find them a challenge as we haven't painted many of them before. We both agreed that staying clear of the mind bending detail was a must. There are so many planes, lines and reflections, not just in the water but the water reflecting on the boats. You can get a little crazy taking it all in. I think if I paint enough of them I will develop a short hand that will help. Right now I get a little lost when there are so many boats in one place. 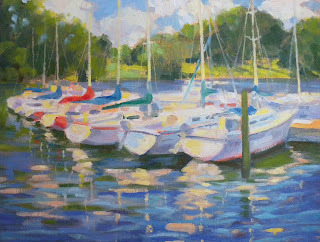 Maybe I should have chosen just one boat to paint! I think Jack is in his element painting boats. He sure is quick! 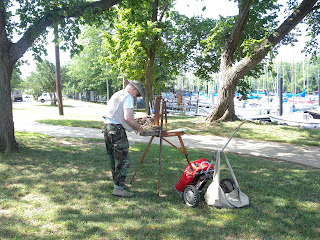 I told him his painting reminded me of a John Marin. I covet Jack's ancient Julien half box easel. They don't make them like that anymore. It has a rich dark patina and hardware that has lasted a lot longer than I anticipate mine will last. It used to belong to an old friend who gave it to him. Great gift! 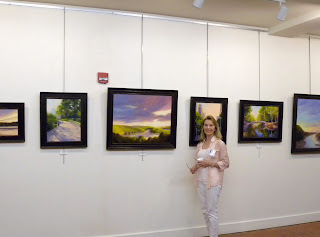 "Everyone Talks About the Weather, but Only Artist's Do Something About It"
That is the title for the upcoming exhibit of member's paintings at the Salmagundi Club in NYC. I love it! I have had this painting sitting in my studio since 2011 because I haven't found the right venue for exhibiting it. This is perfect! I thought all the member exhibits were over at the Club until the renovations are completed in the fall but this one is being squeaked in before the gallery has to be closed. The show will be on view from Monday June 18 through Saturday, July 7th. I need to get to Fed Ex with this thing tomorrow morning! Receiving is the 15th and 16th so I am getting it off at the 11th hour. 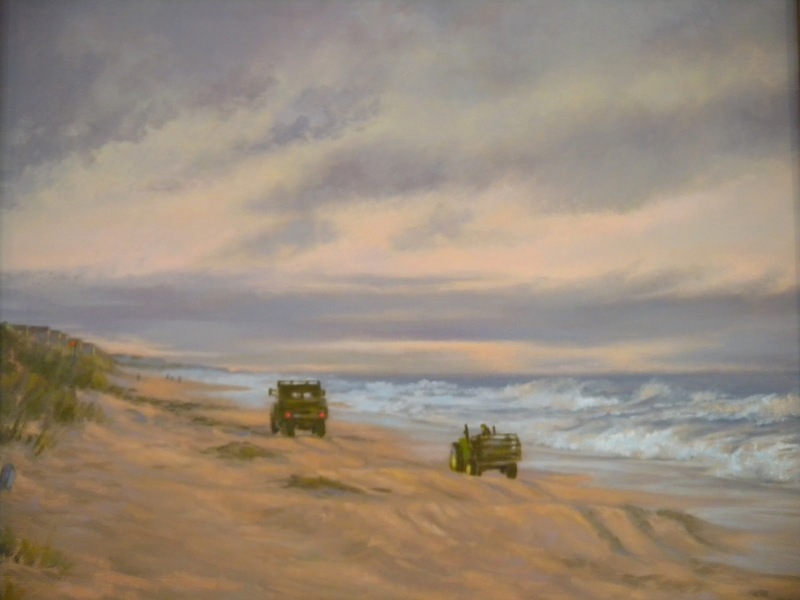 The painting depicts the aftermath of a real whopper of a Nor'Easter on the Outer Banks of NC last November. The beach cleaning vehicles were making their way up the beach which actually had a lot more debree than I have pictured here. I loved the shell colors of the sky as it began to clear. The palette is much quieter than my usual one but it best defined the scene. I wondered today what the result would be if I kept the same values but with my juiced up palette. Would it still work. I think I will take a stab at it on one of my small panels just to see what happens. http://www.salmagundi.org/ Also check out The Salmagundian online http://www.thesalmagundian.com/ which is a blog/journal of member's activities and those of the Club in general. 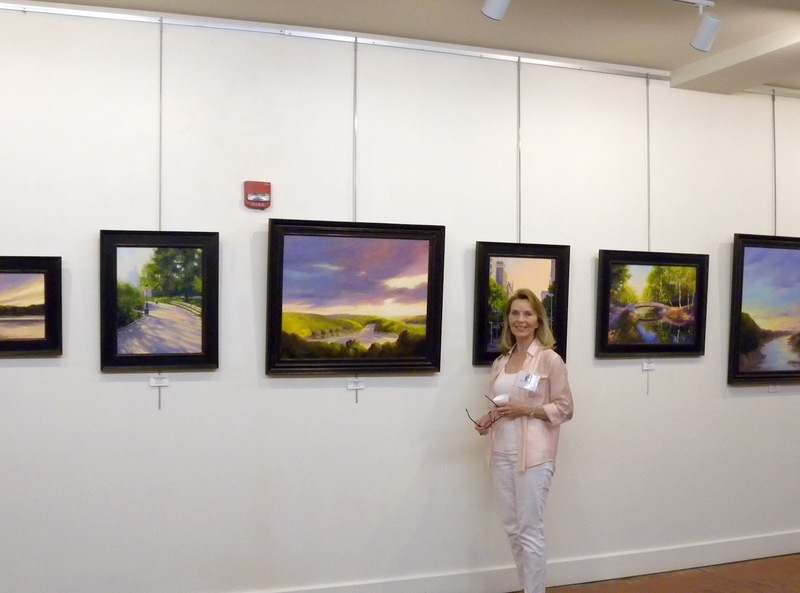 I am on the "tagged" page standing in front of my paintings at the Ratner Museum. I think it is great to have this so members get to put a face to the names we see on paintings Particularly those of us who are non resident members. I have had two life long passions. Horses and art. I have found an interesting way to balance them. The weather this week has been nothing short of heavenly and I have wanted to ride everyday and I have wanted to paint out everyday. Instead of travelling elsewhere to paint, yesterday I decided to pack my gear and head to the barn. Those of you who live in the greater DC area know that the clouds the last few days look as though a whipped cream can has exploded in the sky. I wanted to be sure to capture them. I had almost forgotten I had an appointment for my three dogs to be groomed so that was going to shorten my time. After I dropped them off I arrived at the barn and decided on a change of plan. 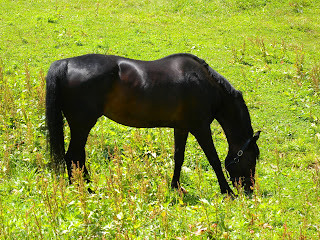 I took my mare Gypsy out to a field next to where I was going to paint and the two of us had a pleasant couple of hours enjoying the cool breeze and bright sun. I had to stop short of finishing the painting but decided I would come back and plant myself in the same spot today. 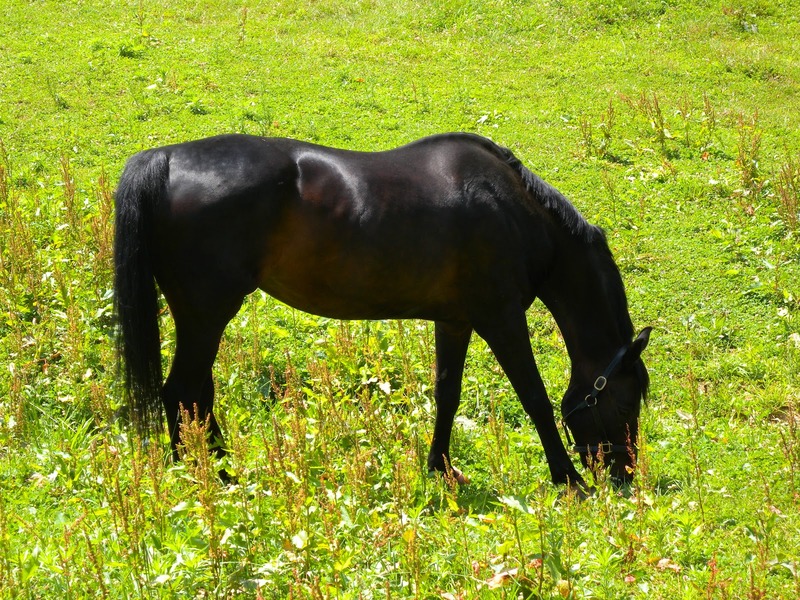 Gypsy is in the field just to the right of me and I used her as my model and placed her in my painting creating a new fenced field for her. This is as far as I got before having to quit and pick up the dogs, and this is where I set up again today to finish. Today I arrived at the barn around 10:00, took Gypsy for a ride (actually she took me) and afterward, while she was having a snooze in her stall, I headed back to where I painted yesterday. The light and clouds were the same and I had already captured the sky. 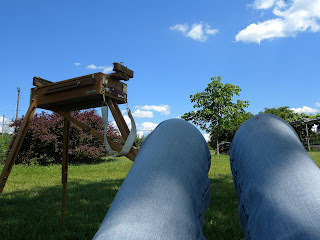 Today I concentrated on the foreground shadows from the large tree I was standing beneath. Note to self.....bring more to eat than the stale granola bar in my backpack and a thermos of water. I was starving! I quit around 3:00 but I had taken time to lie in the grass and look up at the sky through the tree. I realized that I was having a day like the summer days I had as a kid. I would leave the house in the morning and stay out all day until hunger drove me home late in the afternoon. Sleep like a log and get up and do it again. Sounds like a plan! 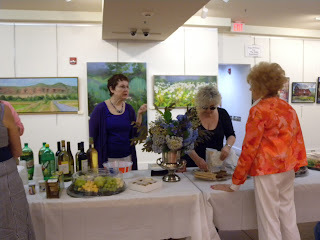 Artist's Reception for "Landscapes and Other Visions"
What a gorgeous day today was! I am sure Queen Elizabeth would like to have exchanged weather with us and that may have worked to the advantage of both of us:) I can't imagine anyone wanting to be indoors today as the the temperatures, light and colors outdoors were nothing short of spectacular. Happily a fairly large amount of people gave up the sunny afternoon to come spend it with the nine of us who were exhibiting our work at the Ratner Museum. I wish London could have had a day like this as the flotilla on the Thames was a once in a lifetime, extraordinary event. As an artist I really felt for the photographers and painters there to capture it but it certainly didn't dampen the spirit and joy of the people. Congratulations UK! Back to our big day.....It was a pleasure. Good friends joined me to celebrate and I could not have asked for a better group of artists to exhibit with. Thank you to Tom Roberts who is always there to support me and always has his camera ready! He took lots of photos that I haven't seen yet and was kind enough to take this one with my camera while I was being introduced. He knew I would want to do a post this evening. I only had time to get off a couple of shots before people started to arrive and then I left the job to Tom. The photo below captures Jane and Marilyn with Stella setting up the buffet table. Behind them you can see three of Alexia Scott's paintings and off to the right one of Judy Gilbert Levy's.